ROCKETSROCKETSROCKETS comes from Radial Games, an indie team responsible for Monster Loves You and sharing some developers with the studio that made Fantastic Contraption. The game is a couch-competitive duelling game about weaponised rockets dogfighting it out to be the last one standing. As far as party games go, this one is fast paced, energetic and very brightly lit. 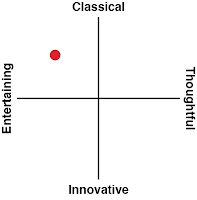 I always like to start reviews with a positive, and by far the biggest standout for me was the pounding techno soundtrack. There are many upbeat tracks which all serve to pump up the player, thanks to Sydney based producer Ben Lam and Power Up Audio. The game even has some of its visuals synced to the bass drum hits, including the menu options and the trails left behind by rockets. The soundtrack ties everything together into one energetic, hypnotic package, elevating the whole game in the process. The gameplay is reminiscent of arena duelling and shooting games such as Starwhal, or Astro Duel Deluxe on the Switch. 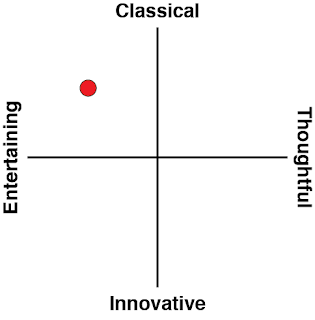 The focus is on competitive couch multiplayer, working best as a four player free-for-all session. 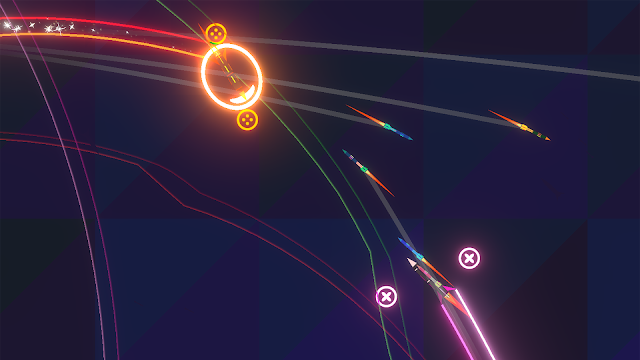 Each player controls a rocket and flies around, evading obstacles and trying to damage opponents. The game’s current build on the Switch offers various tournament options and victory conditions with deep customisation options, as well as a zen mode where you and three friends can fly around in peace. There’s not a whole lot of customisation available in ROCKETSROCKETSROCKETS – aside from choosing from one of four rocket types at the start of each round, each player has the same tools available to them. Movement is handled by pointing the direction you want to go with the direction stick, which is affected by a bit of friction and inertia so your movements are harder to predict. Each ship is equipped with forward-flying missiles, a gravity-affected projectile and a mine which is laid behind your flight path. Players can also shield with the shoulder buttons to temporarily mitigate some damage. The result is an all-out dogfight with pursuits and chases, reversals and crossovers. It’s fairly difficult to stay still with the game’s floaty control scheme, and getting a good hit onto your opponent is a real challenge. I’ve shared a lot of couch party games with friends on my Switch, and I’ve made the most use out of the tabletop, one-JoyCon-each setup to introduce all kinds of weird and wacky games to people. What I’ve found to be crucial to a party game’s success is the first 15 minute impression that encourages your impromptu pairup to keep playing, and that is almost entirely determined by the game’s legibility. By this I mean – from a glance, can a new player figure out how to play, how to win, and whether they’re doing well or not? The previously mentioned Starwhal is great at this: you’ve got a heart, you’ve got a horn, connect your horn with their heart and protect your heart from their horn. The less talking you need to do, the better. ROCKETSROCKETSROCKETS is, unfortunately, a lot less legible. 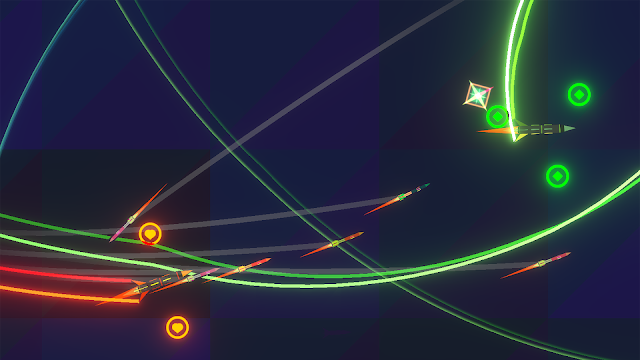 The game’s bright neon art style is striking to look at, but can work against a new player by muddling up important information such as their ship and their weapons, and harmless window dressing. Rockets and mines can be very small indeed when played in tabletop mode, and unless players are familiar with the types of weapons in the game it can be hard to figure out where is and isn’t safe. The pace of the game is also very quick, so players can rapidly be forced onto the defensive with no real way to turn around and fight back. Once players picked up the various offensive and defensive options they had, the games got more competitive, but it took some convincing to get people to continue playing to that point. Ultimately the biggest deterrent I found was the game’s camera. Most arenas are fairly large to let players zoom around them, but the camera will change its scope depending on how close the players are to each other. This means that sudden movements will be met with sudden camera changes, and it’s very difficult to aim effectively once your field of reference keeps changing. If a camera does get too zoomed out, it’s also difficult to see when a player gets hit, and why they have taken damage. There’s also a confusing mechanic where if a player runs out of lives, they can get back into the game by bumping someone who’s still up and stealing one of their lives – which in theory is great to prevent the third and fourth players from sitting around idle for too long, but it adds further to the visual clutter in an already difficult game. It was a little frustrating for me to see the game’s visuals rendered in such a complex manner when ultimately the game’s mechanics are so simple. The game doesn’t lend itself to strategic decision-making, given that every player has infinite ammo at all times and there are no secondary goals aside from fragging the other player. Weapons tend to be inconsistent in their aim paths, and coupled with the frenetic camerawork it’s hard to attribute a successful hit to skill. And three hit points per ship seems low – matches would be all but over in less than a minute, and the game’s six maps would exhaust their strategic depth all too soon. Altogether the game held attention for about an hour, which is not the best compared to the Switch’s many party offerings, but can be a worthwhile game to consider. 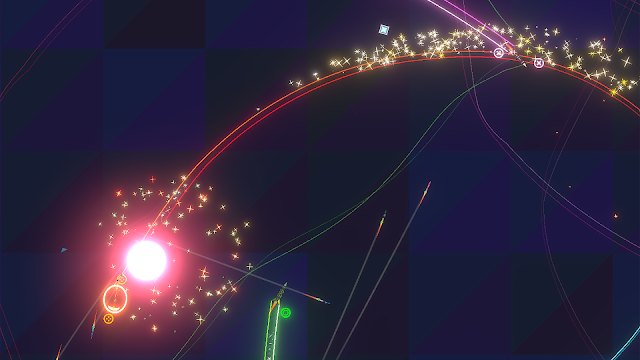 The game also features a zen mode, which allows players to fly around and draw patterns with their rockets’ contrails. This was an interesting enough distraction, and the music for zen mode is fantastic, but even solo there’s no option to control the camera size. 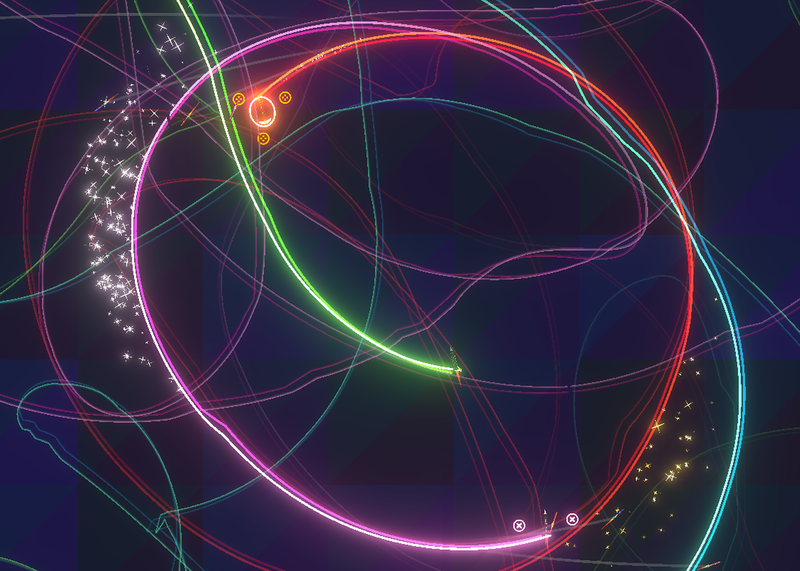 At its current shape, zen doesn’t feel like a fully fleshed out game mode. So far, the competitive mode is still where it’s at. ROCKETSROCKETSROCKETS started its life in Early Access on Steam, spurred by a challenge by Radial Games to ship a product quickly as opposed to getting bogged down in the weeds. And for what it’s worth, content packs throughout the game’s life cycle on Steam have certainly added to its value, and I hope this continues into the future. I do think that the game is one or two elements and patches away from being a truly enjoyable party experience, so while I’m putting it aside for now, hopefully this will be one worth coming back to.